‘Feirm Factor’, the television format developed by Irish production house Good Company Productions, has gone global after it was optioned by six territories across Europe. 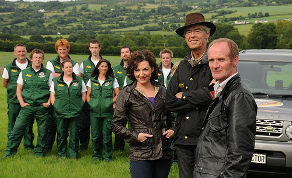 Originally broadcast on TG4, the reality TV format sees 10 farmers compete in a variety of agricultural tasks as they bid to be crowned their nation’s finest farmer. The Irish format has now been picked up by Fremantle Media in France; Tresor in Germany; Meter/ Shine in Sweden; Monster in Norway and Mastiff in Denmark and Zodiak in Finland. The format was sold by Nordic World on behalf of Good Company with Nordic set to bring ‘Feirm Factor’ to MIPCOM next month and to MIPTV in April amid interest from producers in the US, Australia and New Zealand. Speaking to IFTN, Evan Chamberlain, the founder of Good Company and the producer of the ‘Feirm Factor’ format, said that he was not surprised that the format had appealed to international producers. He said: “I think something that we tend to forget is that as a small island of very fine film and TV makers is that format creation is a very, very simple process. You need to think of the right genre, where it fits, you need to think of the station, and you need to think of what an Irish audience might like. Broadcast for four seasons in Ireland, ‘Feirm Factor’ has already proven that it can travel successfully after being successfully produced in the UK by Welsh producer Cwmni Da. Their version of the format has aired on Welsh-language broadcaster S4C since 2009 having been broadcast for four series. Chamberlain told IFTN that he is currently developing a new family-based variation on the format which he hopes will be broadcast on TG4 next year. He said: “‘Feirm Factor’ is a format we created in Good Company about five years ago. We had a great run for four years on TG4. We’ve taken a year out and are hopefully going to return to TG4 in 2013 with a new take on the format.